Hi folks! If you would like to create an online job listing - here is a great list of themes and plugins that will fit your needs. JobJockey has all you need and the fact that it works on WordPress makes everything easy to set up. It handles search engine optimization and has plenty of features that allow you to get started right out of the box. You just have to worry about selling space and offering support to customers. Its seamless integration with PayPal allows you to make money on auto-pilot. This theme also offer many features that will help you to build great job listing site such as search engine optimization and many others. And in fact that this theme is WordPress based site, you can set up this theme in seconds. Also with clean-look layout, JobsHub is easier to be customized. Jobpress is a very special theme from web2feel. I am very proud of it. I wanted to create a free Job board based on wordpress. I was not very sure of getting this done as a complete solution when I started. But what can I say, the WordPress community is so awesome, help is just a mouse click away when you need it. 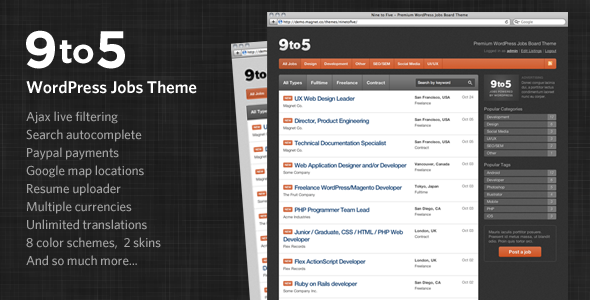 With this theme you can host your own Job board for free. Registered users can submit job listings on your site and an admin can review and publish it. This theme is WordPress 3 ready with features like Custom menu, custom post types, custom taxonomies, Custom page templates, widgetized sidebar, and it includes 2 custom widgets and theme option page . I have made two screencasts to explain the job listing process. Offer job listings on your site with Jobbin! Your users can add jobs or browse jobs apply via the suggested method. The administrator can approve/deny any job and controls publishing status. This plugin is meant to help you solicit and collect job applications through your wordpress site. WP Jobboard Pro (WJP) is a wordpress plugin, which can be use for job listing, and collect job applications through your wordpress site. A plugin for managing job lists and job applications on your WordPress site. It supports all the features you need to manage your organisation's job openings. The easiest way to post jobs and manage applicants in a WordPress site. Connects with SmartRecruiters, the free Open SaaS recruiting software. Job-a-matic is a great way to earn additional revenue from your existing website and provide valuable content for your users with a free hosted job board. The Job-a-matic module uses SimplyHired's XML API to display job postings from their database directly within your WordPress site. The plugin allows you to build an online jobs/resume website, where the applicants will be able to search, update, add/remove or edit their resumes/profiles. This plugin is for standalone WordPress sites. In addition, users can also add/delete/change the descriptions in addition to uploading images/photos. This plugin allows you to add a basic job board to your WordPress website or blog. Bepro Listings allows you to create posts with a combination of additional information like, costs, contact, or geography. Widgets and shortcodes then help you to search and view this information via various formats including google maps. Consider using these building blocks for your next listing site. Have your own jobs page directly in your WordPress site. Easily add and edit your job vacancies and securely manage candidates that apply for these jobs all in one online app.